Heat oven to 350°F. Wrap outside bottom and side of 9-inch springform pan with heavy-duty foil to prevent leaking. Grease inside bottom and side of pan with shortening. In small bowl, mix crust ingredients. Press in bottom of pan. Bake 8 to 10 minutes or until set. Reduce oven temperature to 300°F. Cool crust 10 minutes. Meanwhile, in large bowl, beat cream cheese and 1 cup brown sugar with electric mixer on medium speed until smooth. Beat in eggs, one at a time, just until blended. Add 3/4 cup whipping cream and 1/4 cup coffee syrup; beat until blended. Pour filling over crust. Bake at 300°F 1 hour 10 minutes to 1 hour 20 minutes or until edge of cheesecake is set at least 2 inches from edge of pan but center of cheesecake still jiggles slightly. Turn oven off; open door 4 inches. Let cheesecake remain in oven 30 minutes. Run small metal spatula around edge of pan to loosen cheesecake. Cool in pan on cooling rack 30 minutes. Refrigerate at least 6 hours or overnight. In 2-quart saucepan, melt 1/2 cup butter over medium heat. Add 1 1/4 cups brown sugar and 2 tablespoons coffee syrup. Heat to boiling; cook and stir 1 minute until sugar dissolves. Stir in 1/2 cup whipping cream; return to boiling. Remove from heat. Cool 10 minutes. To serve, run small metal spatula around edge of springform pan; carefully remove foil and side of pan. Cut cheesecake into slices. 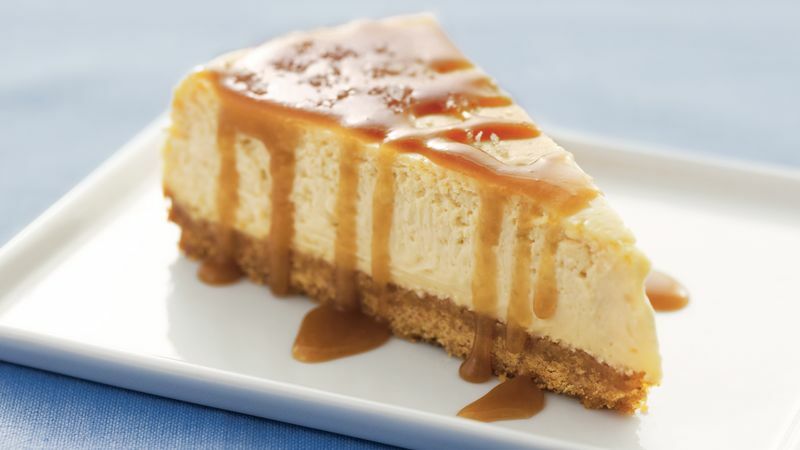 Drizzle caramel sauce over slices; sprinkle with salt. Cover; refrigerate any remaining cheesecake. Caramel-flavored coffee syrup can be found by the coffees and teas in the grocery store. The caramel sauce can be made ahead. Store it covered in a microwavable bowl in the refrigerator until serving. Just before serving, uncover bowl and microwave on High for 2 minutes 30 seconds to 3 minutes 30 seconds, stirring occasionally, until the sauce comes to a full boil. Watch carefully so the sauce doesn’t boil over the edge of the bowl.